Plug into the CEO OF YOUR SOUL Network. 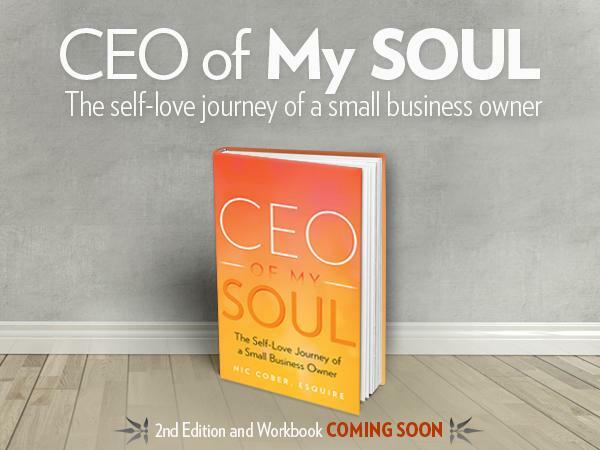 Nic’s first book, CEO of My Soul was published in May 2016. The book is a practical and personal how-to guide for entrepreneurs, and an invitation to join Nic on a spiritual quest for self-love and fulfillment. In it, she shares the perfect blend of valuable business advice woven together with true accounts of relationships struggles, family triumphs, and self-reflection. The book was met with praise from local and national media, including recognition in Essence, Black Enterprise, Fox 5 DC, and DC Refined. The second edition is coming soon, as well as a workbook that takes readers through the step-by-step process of becoming the CEO of YOUR Soul. A graduate of the University of California, Berkeley and Howard University School of Law, Nic is also a business attorney and offers a suite of legal services tailored to entrepreneurs. She specializes in trademark and copyright, contracts, startup incorporation, 501c3 registration, and human resource training. Please use the form below to ask us any questions you may have about our organization or our services. Myself or a member of my team will get back to you as quickly as possible.